Frames: One of the important considerations you need to make is frame material. Two of the more energy efficient frame materials are vinyl and fiberglass. They do a particularly good job of reducing heat transfer and contributing to insulation value. Your ultimate decision on which of these to use may be based on aesthetics and cost. In making your selection, be sure to look for vinyl or fiberglass frames that have been specifically engineered for performance. For instance, both can be designed with chambers within the frame that enhance strength, noise reduction and insulation value. 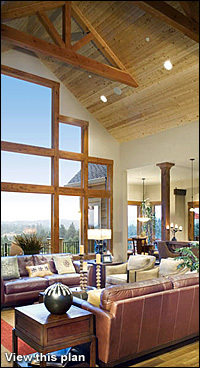 Multiple Panes: Dual-pane designs use an air- or gas-filled space between two panes of glass. This insulates better than a single pane. Some ENERGY STAR® windows include three or more panes for even greater energy-efficiency. Special Low-E coating on the glass blocks infrared light to keep heat inside in the winter and outside in the summer. It also filters damaging ultraviolet light (UV) to help protect interior furnishings from fading. Spacers: A spacer keeps a window's dual glass panes the correct distance apart for optimal airflow between panes. Today's warm edge spacers are made of steel, foam, fiberglass or vinyl to reduce heat flow and prevent condensations. Too much or too little airflow can affect the insulating glass efficiency. Gas Fills: Some energy-efficient windows have argon, krypton or other gases between the panes. These odorless, colorless, non-toxic gases insulate better than natural air.